High probability, actionable and exclusive trading setups provided on a weekly basis. After years of trading and trying many different trading techniques, I have arrived at the conclusion that the most effective trading technique is that of using support and resistance. Entering a long trade near a support level gives the trade a low risk entry with high return. I have developed a systematic approach to analyze the stock charts by combining different methods of analysis to ensure a high probability of favorable trade outcomes, with a 70% - 80% profitable rate. Being a market professional and a trader, I spend long hours monitoring the stock markets and have an acute sense of the stock markets. That will allow me to give timely opportunistic alerts and warnings to you, as my subscriber. You, as a subscriber to “Charting to Profits – High Probabilities Trades” can generally expect to receive at least 2 to 3 stock picks a week on average (posted every Wednesday), subject to market conditions. The stock picks can be Long (Buy) trades or Short (Sell) Trades. ✔ the potential profit targets. I will also provide an update of the Straits Times Index (STI) on a weekly basis (by every Sunday), indicating the various technical levels to watch out for. I believe this service will be beneficial to the subscribers as the world-wide markets head higher. As I use mainly technical analysis to make my trading decisions over the short term, my stock picks will come in the form of technical charting, illustrating the technical pictures of the small-cap, mid-cap and big-cap stocks. So it will be to your advantage if you have some basic understanding of support and resistance of a stock price. Nevertheless, if you are a beginner, you will be able to learn and pick up some technical analysis skill from my analysis as well. An example of the *stock pick, including the disclaimer, is as shown below. • Retest of previous price support at $1.385 and defended the support. • Confluence of multiple supports as describe on the chart above. Suggested stop loss price: $1.380. An example of the weekly update of the Straits Times Index is provided as shown below. Last close: 3329.03 UP trend intact. The nearby supports and resistances are indicated on the above chart. The momentum looks good to break out above the resistance R1 to test the critical channel resistance R2. A break out above R2 is likely to result in trend acceleration towards the key resistance at 3550. ✔ Serious traders or investors looking to maximize their profits consistently on a weekly basis. You will get exclusive and timely access to the top trading opportunities every week, along with proven trading setups with exact entry and exit points. This means getting on the big boat before it takes off. 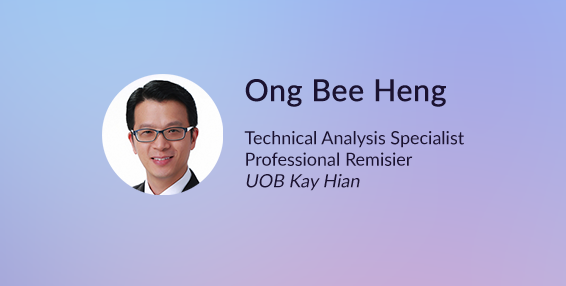 I am a Professional Trading Representative (remisier) with UOB Kay Hian Pte Ltd. After graduating from Nanyang Technological University with a Bachelor in Engineering (Honours), I started my career as a research and development engineer with a renowned firm in Singapore. My work as an engineer equipped me with an analytical mind. I developed a strong interest in trading while working as an engineer. I left the engineering field and joined the stockbroking industry in 2006. I have a Diploma in Wealth Management which was accredited by the American Academy of Financial Management (AAFM). I am a strong believer and practitioner of technical analysis because I believe that prices always move ahead of fundamental news or development. My passion for trading has led me to combine the various western technical analysis methods with the Japanese candlestick charting technique to make my trading decisions. I specialize in swing trading where most of the trades lasted from two days to as long as four weeks. The materials and analysis presented to the subscribers are purely my opinions and views. Any views, opinions, references or other statements or facts provided to the subscriber are personal views and are not supported, sanctioned or endorsed in any way. The materials are provided for information purposes only and is not intended to or nor will it create/induce the creation of any binding legal relations. It does not constitute an investment advice, an offer or solicitation to subscribe for, purchase or sell the investment product(s) mentioned herein. It does not have any regard to your specific investment objectives, financial situation and any of your particular needs. Accordingly, no warranty whatsoever is given and no liability whatsoever is accepted for any loss arising whether directly or indirectly as a result of this information. Investments are subject to investment risks including possible loss of the principal amount invested. By subscribing, you also agree to InvestingNote's terms and conditions here.